More ‘greens’ have filled the market space. Green bags. Green pants. Green shoes. Green caps. Green emulsions. Even Green chalk! Everywhere is green, with a minuscule touch of white. The stores will begin to close early again. Maybe traffic will ease a lil bit- I hope so…Maybe then we can journey freely on Lagos roads. It also means passengers of danfo buses will have to hold tightly to their bags and for a lot of women, their head gears as bus drivers will be in a hurry to catch on highlights of games if not the entire match. So what is the fuss about really? The other day I saw my uncle dearest, Baba John as popularly called, lugging two 25-litre jerry cans obviously filled with PMS; sweating and smiling. His near black crooked teeth shining through like he had a gold medal around his stubby neck worth a hundred thousand euros. Come to think of it; I never really get to see the man in broad daylight despite the fact that I occupy his BQ! Okay, maybe it’s not that bad. There were those Sundays when he returned early from Church; but that was just twice a month at best. His business forage takes him far and far from Eket to Owode, and the neighbouring African countries where he gets his huge truck-loads of palm kernel oil which he supplies to food and pharmaceutical companies. “Daddy John welcome”. From under my Pepsi-canopy where I sit sometimes to unwind and reflect, I called out to him in greeting trying not to sound like the many half-educated folks in our big compound of smaller detached houses. I wished I could carry one of those for him but I lacked the strength and willpower. Still I offered. “Ahhh…thank you my son, I’m sure you have some school papers to mark. Let me handle this as a big man” was his response as I smiled to myself, glad he didn’t take me up on my courtesy offer. I stopped getting angry when people refer to me as a small man or imply it since my twentieth birthday because that is what I am- A wiry lad. At twenty four, teaching a class of senior students at Crescent High, I would pass as one of the students myself, as a junior student in fact! It still baffles me how I got that job teaching Physics to a bunch of gals and boys three times my weight and height. “Daddy John, have you added crude oil trading to your line of business?” my confusion now obvious. “Ha ha ha ha. Ahem…” he cleared his throat. “No, I am only preparing for the next few weeks. 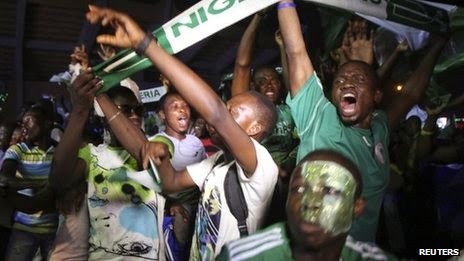 You see, I would hate to run out of fuel while watching the world cup, not even this time around that Nigeria managed to qualify” his thumb and forefinger raised in the air forming a small circle signifying ‘managed to’. “So it is very necessary to have some reserved” he explained proudly carrying the last keg of PMS to his guest toilet turned store attached to the side of his apartment. Happy to be home alone, Mama John stayed glued to the TV watching the fourth part of ‘It is my throne’ on Africa magic. Her throaty laughter reaching the doorway as Baba John and Kenneth made their way in. Rising quickly, her eyes darting to the wall clock above the Television set, Mama John reached to Kenneth to get her husband’s satchel. Curious to hear the new rules even though I wasn’t technically living in their apartment, I felt it was crucial to know too and so I perched on the farthest of the living room sofa…my ears standing. “Numba 2- No parading or bumbum shaking in front of the TV anyhow when I am seeing a match. Hold your sons and stay with them in the room if possible, I know they love football like me anyways but tell them no bouncing on the sofa. 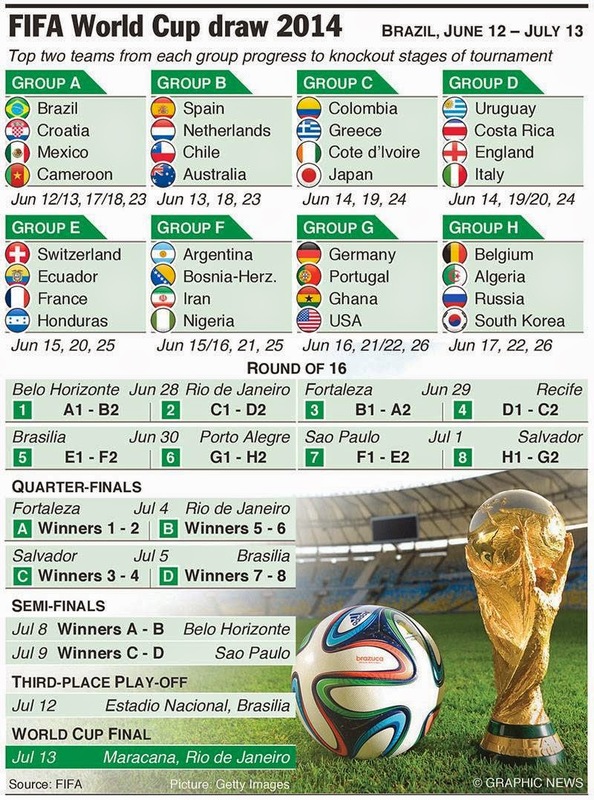 “C…come come,” take this match fixtures table and paste on your kitchen wall. Times and days have been highlighted so you can properly prepare. …and on and on my uncle went. It is time to gather again in our favorite jersey colours. Time to bite non-existent fingernails, gnash teeth and scream curses at lost opportunities! That’s the big deal about the World Cup. Up Eagles!!! Pardon my ignorance but please enlighten me...what is WAGS?